Send a daily Low-Inventory email: A daily email is triggered to your main account email address that shows you all Low-Inventory Items. Enable Purchasing from the public: Allows you to purchase Inventory items / parts from your Customers. 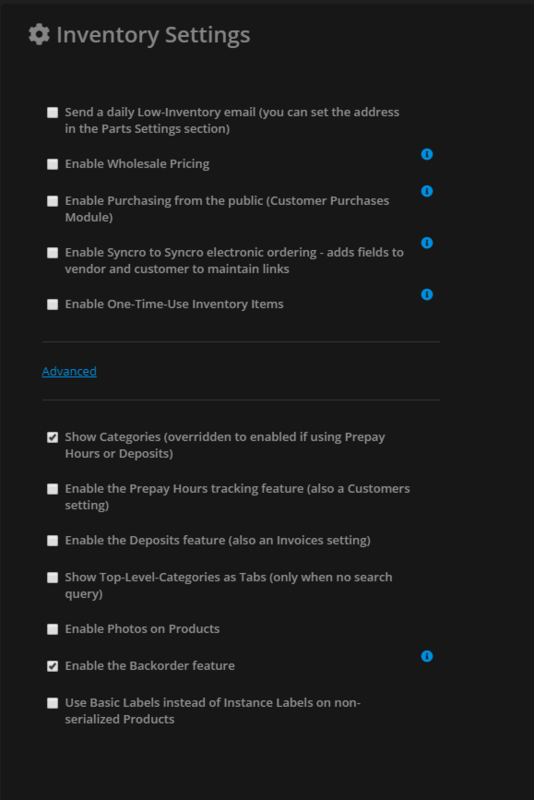 Enable Syncro to Syncro electronic ordering: Allows you to set up and purchase from a vendor that uses our application. Enable One-Time-Use Inventory Items: Enables the "One Time Use" checkbox on Inventory Products that will set them to be disabled once the stock runs out. List of Product Categories: Each product you have can be placed in a category. Certain categories are necessary to perform functions, such as utilizing prepay hours. Add your desired categories to this list, separated by a comma and no spaces. Use Basic Labels instead of Instance Labels on non-serialized Products: This toggles Basic Labels as the default labels and hides the the In-Stock Label.